Microsoft’s Build conference kicked off today in San Francisco. The keynote provided a snapshot of how Microsoft is going to double-down on its previous commitment to open source, cross-platform, and helping developers create amazing experiences. Though some if it may seem shocking, it shouldn’t be when combined with the earlier commitments such as creating .NET Core and ASP.NET Core to run .NET applications on Mac and Linux and bringing SQL Server to Linux. We’ll unpack some of the most interesting and exciting announcements from Build in the paragraphs that follow. More to follow tomorrow for Day 2! It’s easy to make fun of any missteps Microsoft makes, such as the Start Menu debacle in Windows 8, but it’s hard to ignore the install-base for Windows or the visionary leadership Microsoft is offering right now with the Windows platform. If you want to make an impact on the desktop, Windows is the place to do it–and Windows 10 specifically, because of how quickly its being adopted by the community.Now, with a single and universal app store across all Windows 10 devices (desktop, tablet, phone, Xbox, HoloLens, etc) there a very compelling story for writing an app once and deploying it on many platforms–even iOS and Android (keep reading). As we detailed in our previous newsletter, Microsoft recently bought Xamarin. Xamarin allows developers to use Visual Studio, C# and .NET to build native Android and iOS applications. This, together with the Universal Windows Platform (UWP) allows you to target even non-Windows-based devices and share a lot of your code across all the versions of your app. A lot of the changes detailed in this newsletter are coming this summer when the Anniversary Update for Windows 10 is released. Previously known by the “Redstone” codename, this update will be free for all Windows 10 devices. Perhaps the biggest surprise in the Build keynote was the announcement that the bash shell (from Linux) is coming to Windows. And it’s “not a VM. This is not cross-compiled tools. 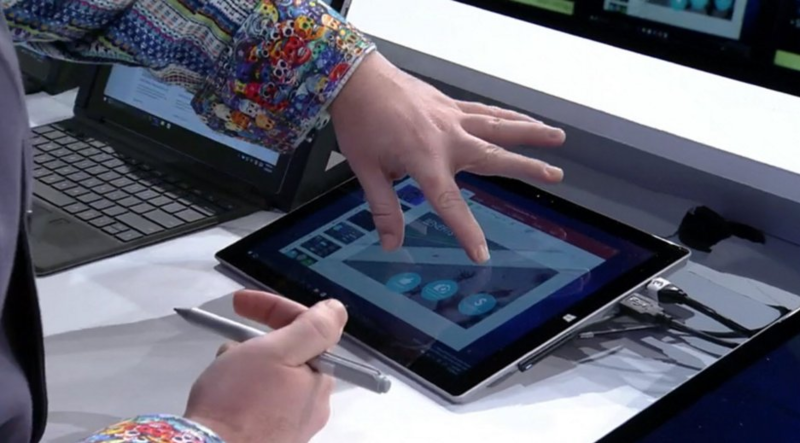 This is native,” says Microsoft’s Kevin Gallo. This signals, yet again, Microsoft isn’t joking about its commitment to creating experiences on any platform and open source tools. Microsoft’s Scott Hanselman has a blog post detailing more about this if you’re interested. One of my favorite demos in the Build keynote was the pen and ink improvements in the upcoming Windows 10 update. There was a really cool touch-based ruler the user was able to move around on the screen exactly like a real ruler. Then, the user was able to snap object to the ruler or draw lines along it’s edge with the pen, interacting with it in exactly the same way you would in real life. Anyone remember the (failed) Microsoft Tablet PC of 2001? Well, it’s back, and now technology and apps have caught up! With the release of the Anniversary Update for Windows 10, the Windows and Xbox app stores will come together into a single store. This change has been in the offing for years. It’s the realization of one of Microsoft’s primary goals in creating the Universal Windows Platform (UWP): getting a single app store across all Windows devices. You can now add Xbox to the list of devices to which you can deploy your Universal Windows Apps. The biggest announcement at Build last year was definitely the Hololens, an augmented reality computer-and-glasses combination that totally blew us away. 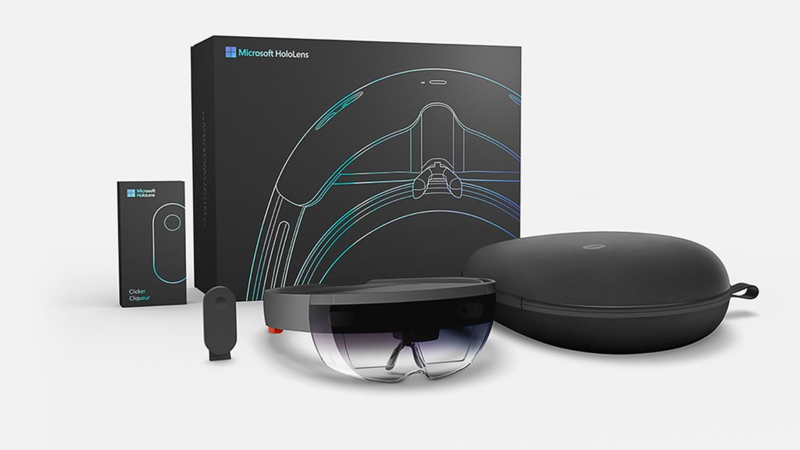 The developer units of Hololens are shipping today to allow the developer community to get started creating even more great apps and content for this game-changing device. We feel like Hololens differentiates itself in two major ways. First, it’s an entire computer. There’s no need to pair it with another device for more computing power. The Hololens IS the computer. Second, it uses augmented reality instead of virtual reality. Virtual reality–creating an entire virtual world the user can interact with–certainly has its place, but we think augmented reality has even more compelling real-world uses. Augmented reality allows the user to add virtual elements to their perception of the real world. One can easily imagine information being superimposed on real life and interacting with other people together around that shared visualization. Outside of games and simulations, though, it’s harder to imagine many real-world uses for virtual reality. That’s why we’re so excited about Hololens. It changes the game–and does in with a device running Windows 10, which allows developers like us to create applications just as easily as the ones we’re creating today for other Windows devices. Conversations, AI and Bots Everywhere! A common theme throughout the AI (Artificial Intelligence) demos was bots. Bots integrating into Skype, into apps, into phone calls… If you have used Slack and its myriad of integrations, you are used to the concept of mixes of apps, bots and people in a conversation. In fact, Nadella was talking about Conversation Canvases, and Conversation as a Platform. Read more at https://dev.botframework.com/, and https://www.microsoft.com/cognitive-services/ To get a feel for how wide this concept is, take a look at the menu structure of APIs! Cortana has evolved way past Microsoft Bob and has gone from annoying to surpassing her sisters Siri and Google Now. You will find her helping you out inside Skype, and offering to set reminders for things you promise to do in conversations or email. 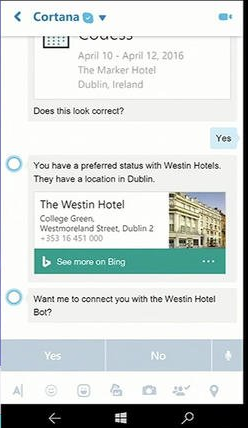 In fact, as shown in a demo, Cortana will be brokering conversations between you and bots! You will also be able to integrate her services into your own apps. On the one side: The whole demo of a professor teaching Case Western students remotely using Hololens was amazing – definitely helpful for bringing great teachers to remote students, and of course helpful with say remote surgery. Also within aviation, construction, home improvement… the possibilities are endless. Here is where we will create a lot of highly skilled jobs building this software, and it will enhance the jobs of existing employees. On the flip side: the amazing advances in AI, from deep understanding of language, to facial expressions, will surely eliminate a huge number of low skilled jobs, like picking up the phone at the pizza store. You might argue these are brain-dead jobs…but still, they are paying jobs, they will disappear, and this technology provides new jobs for a lot fewer, highly skilled engineers. I think we are seeing the beginning of a trend in eliminating service jobs. Since we are a service economy, this should be worrying a lot of people…who didn’t watch the keynote. Another reflection is that this is a flash back to the original visions around web services, how different applications would all work together as components, to help you do things like book tickets and hotels. But now, instead of the glue being APIs written and consumed by developers, these ‘micro services’ are glued together by bots and orchestrated by Cortana. Web Services have come full circle from machine to machine connections, to personal services. To sum it up so far, a lot of far reaching and exciting technological and social changes, and this is just day one. Stay tuned for day two! Nice job. I couldn’t watch most of it, and your summary was just what i needed. Thanks!